You are going to love being able to get out and about to explore North Myrtle Beach, SC and all that it offers visitors for a beach vacation. There is much to do in the area for all ages. Kids love all of the colorful miniature golf courses that have waterfalls and giant animals. Moms love the shopping that is in the North Myrtle Beach area and dads appreciate the fact that Myrtle Beach has more than 100 golf courses. Add in a fantastic coastline where the white sandy beaches meet the vast Atlantic Ocean and your North Myrtle Beach vacation days are set! In order to fully take advantage of all the entertainment, amusements and attractions in the North Myrtle Beach area it is important to spend your North Myrtle Beach vacation in a central location. A Great Escape is a small North Myrtle Beach condominium complex that is only three stories tall. This oceanfront North Myrtle Beach complex puts you one dune line away from sinking your bare feet in the warm sand. 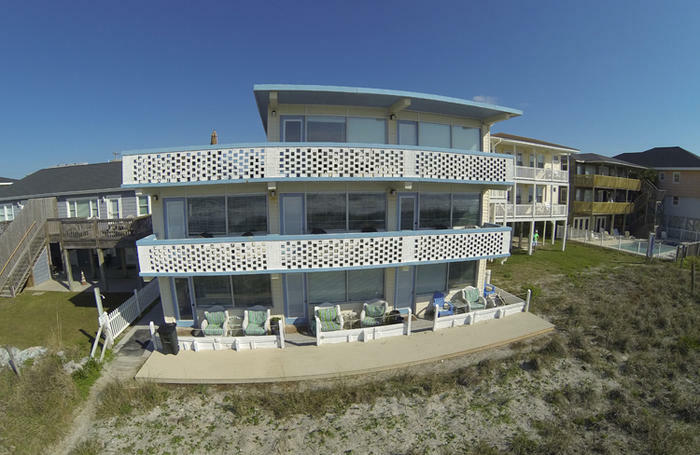 This oceanfront retreat is near the very popular Cherry Grove Fishing Pier where you can either cast a line in the ocean and reel in your own catch of the day or where you can watch experienced fishermen catch a mess of saltwater fish. Walking out over the Atlantic Ocean on a pier is a thrill for all ages and your family should not pass up the opportunity to do so during your stay at A Great Escape in North Myrtle Beach, South Carolina. This quaint North Myrtle Beach vacation destination has three North Myrtle Beach vacation condos on the first floor, which is ground level. The second story of A Great Escape has three more North Myrtle Beach rentals and the top floor has two condo rentals. At A Great Escape you may choose between a one-bedroom, one-bath North Myrtle Beach rental that sleeps six or a two-bedroom, two-bath North Myrtle Beach condominium that accommodates eight.